Calling all girls! I have a new Barbie Video to share with you today! One lucky reader will get to win their own copy!! Barbie Spy Squad is out in stores on March 1st! 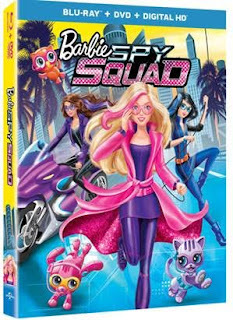 Barbie™ and her best friends Teresa™ and Renee™ transform from hard-working gymnasts to undercover secret agents in this exciting, action-packed adventure! When their amazing gymnastics skills catch the eye of a top-secret spy agency, the girls are soon following clues to a gem-stealing cat burglar who has escaped everyone on the case. With their high-tech gadgets, disguises and quick wit, can this squad prove that smarts and teamwork can get the mission accomplished? My little granddaughter is a huge Barbie fan! My 8-year-old daughter Alyssa is the Barbie fan in my life. My friend's daughter is the Barbie fan I know. My 6 year old daughter is a huge Barbie fan. My 7 year old daughter is the Barbie fan.